I love to add oats in my diet quite often, i can start my day easily with a bowl of oats porridge.Yep anything with oats will definitely satisfy my tastebuds completely.Two days back, i quickly prepared this healthy and super comforting sambhar bath quickly with rolled oats, cooked dal and with usual sambhar powder. I just went for tomatoes and onion instead of mixed veggies for making this sambhar bath, i enjoyed thoroughly this healthy and super filling oats sambhar bath for my breakfast. As i told earlier,my theme for this week's blogging marathon is low fat breakfast, this oats sambhar bath suits prefectly for the theme. If you are bored of usual porridge,dosas or idlis with oats,give a try this super comforting food low fat breakfast.Check out the other marathoners running this 20th edition here. Heat enough oil in a pressure cooker,let splutters the mustard seeds,urad dal and add the asafoetida powder,dry red chillies, curry leaves,fry them. Now add the chopped onions,chopped tomatoes,cook until the onions turns transculent and tomatoes turns mushy. Immediately add the sambhar powder,cooked toor dal and three cups of water, cook everything for few minutes..
Stir in the rolled oats,close the pressure cooker and cook for upto a whistle. Once the steam gets released add the chopped coriander leaves,lemon juice to the oats sambhar bath and give a stir. Enjoy this healthy dish simply with a paruppu thogayal. wow all oats goodies today... looks perfect.. Very interesting one...really a super healthy n delicious recipe...thanks for sharing!! mmmm...looks so yummy.. i am feeling hungry. Love your idea with oats. Stop by at my blog too. 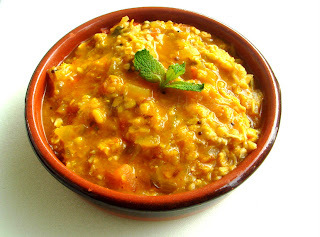 That's a healthy & flavorful dish..
Lovely recipe with oats!!! looks so much like bisi bela bath!!! Very healthy but scrumptious khuchdi. Love it dear. Nice,healthy and delicious..sambhar bhath looks tempting..A must try! Priya I will die for a bowl of this bliss. My fav too...even i used to prepare the same way...Very healthy ! But never tried this with parupu thogayal..sounds very interesting, will try soon!!! Great recipe and looks superb! delicious... love the addition of oats..
You come up with so many intresting recipes and this is one of them. Healthy and delicious. Great use of oats. That sounds like nice lunch idea! Simply delicious one! Sounds like a delicious variation from the usual oats dishes. cud'nt have ever thought of this one..super duper recipe! Have never had Oats with sambhar. I definitely have to try this, oats in sambar, so innovative. Love it Priya!